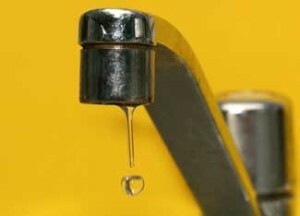 A leaky faucet is one of the most common plumbing maintenance calls. Waking up to a leaky faucet can really put a damper on your day. There are many possible causes of leaking faucets. Failing to fix a leaky faucet could lead to more expensive problems in the future. Leaks in the home can reach up to 10,000 gallons per year, enough to fill a swimming pool. Here are 5 common reasons why your faucet might be leaking. If the leaky faucet is not consistent throughout the day or changes with different uses of water, then the water pressure might be to blame. The water pressure might be too high for the faucet. Water pressure exceeding recommended specifications can cause parts within the faucet to fail more quickly than expected. Too much water pressure can also create leaks elsewhere because the flow of water backs up. When in doubt, turn the pressure down a notch. Simply put, the more often parts are used, the more often they will need to be tightened, replaced, or fixed. Constant use may cause the adjusting ring and packing nuts in the steam screw to become loose. This can create a leakage near the handle of the faucet. Sometimes, the packing nut can be tightened for a quick fix. However, new parts are always guaranteed to immediately fix the leaky faucet. A worn out or improperly installed washer are the two most common causes of a leaky faucet. Each time that the faucet is used, the washer is forced against the valve seat, which creates friction and resistance. Eventually, the washer wears out and needs to be replaced. Washers must be of the right size and properly installed in order to prevent faucet leaks. When you use your faucet, water sediment can build up within the unit. The sediment can cause the valve seat, the inlet seals, and the outlet seals to prematurely fail. This will cause a leaky faucet if not cleaned and maintained properly. The sediment can be cleaned out, but it is recommended that a professional plumber does this to ensure parts do not become damaged. Although unlikely in most cases, damage to the piping or fittings used within the faucet system can create leaks. Cracks in the piping may create an imbalance of water pressure, leading to a leaky faucet. For problems with broken piping, professional assistance from a plumber is highly recommended. An inexperienced homeowner could end up further damaging the faucet system if the process is not done correctly. If you do not have any plumbing experience, then it is not recommended that you try to fix a leaky faucet on your own. Call a plumber for assistance. The best local plumbers will also be willing to let you watch the process. Then one can learn how the faucet systems works in case the problem happens again.